How often do you notice that as you inhale, the temperature of the air inside your nostrils gets cooler and as you exhale it gets warmer? Take a moment to breathe and try it! We are always breathing, right? But we aren't usually that aware of the breath. When you felt your breath, you really gained a deeper experience of being alive. In other words, you became more self-aware in that moment. This heightened self-awareness not only helps us make better decisions in life as individuals, but it is also the key to solving the world's great problems today. So how do you increase your self-awareness? Simply do what you did when you read the beginning of this article: feel your breath. The practice of noticing the breath is also called meditation. I used to think meditation was something only "weird hippies" do, but it's just noticing that you're breathing! Now I am that weird hippie. When I was a freshman at the University of Michigan, mindfulness meditation completely changed my life. At the time, I was extremely depressed and I began looking for every natural solution to my inner pain and loneliness. Around the same week I began desperately looking, I thankfully stumbled onto a free drop-in mindfulness session that Denise Kozikowski, an academic advisor at U of M, was guiding. I left that session feeling the most at peace I had felt in a long time, but I didn't go to the sessions consistently and never tried meditating on my own. When summer came around, I was still depressed so I told myself I had to do something different. I decided I was going to meditate at least 5-10 minutes daily for a month. After about three weeks, I started feeling a lot happier and more content, but what was more surprising was I felt as if I had been asleep my whole life and had just woken up. I stopped going through life on auto-pilot. I begin to realize who I am and what my purpose is in life. I knew this practice was important, not only for me but also for so many people who feel lost in this world. 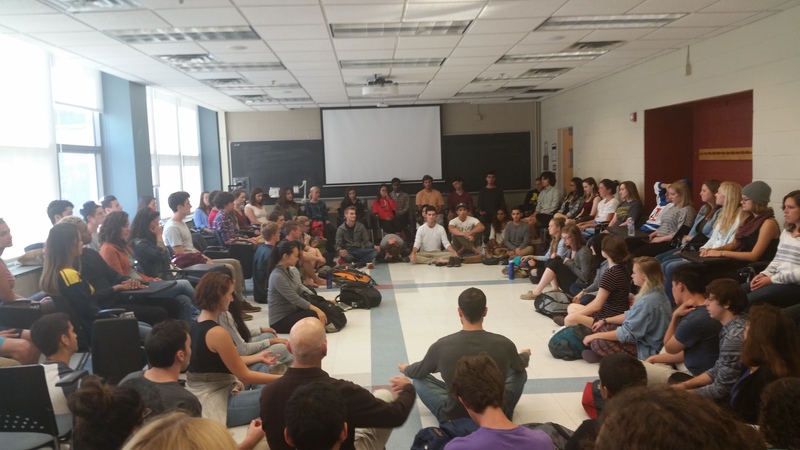 Right before my senior year, I decided to become an MMI Certified meditation teacher and I co-founded a student organization at the University of Michigan called Awaken Ann Arbor, which helps students learn how to meditate, gain a deeper sense of purpose, and grow spiritually without emphasizing dogma. You can watch a short documentary about Awaken here. Take a moment to remember that you're breathing today. Remember the precious gift of being alive. Remember that the breath is something all humans share. Deep within us, beyond all the divisions and barriers we may create between one another, there is something that connects us all.